When you have a game like Super Monkey Ball Step & Roll, which centers on collecting bananas, you couldn't pick a better cross-promoting partner than the leading distributor of bananas in the United States, Chiquita. 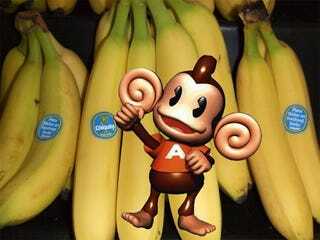 Starting next month, more than 180 million Chiquita bananas will feature stickers promoting Super Monkey Ball Step & Roll for the Nintendo Wii. In exchange, players can expect to see the Chiquita brand featuring prominently during sequences in the game itself, which could be some of the least noticeable product placement ever. I couldn't tell you which distributor delivered my last banana, but I remember peeling off the sticker and placing it on something, somewhere. Those stickers are so commonplace here in North America that we rarely notice they are there. Maybe if banana peels tasted better we'd pay more attention. Slightly more noticeable will be the Super Bananza Sweepstakes, launching soon at www.chiquitabananas.com, in which one lucky family will walk away with a 50" HDTV, a sofa and four gaming chairs, a copy of Super Monkey Ball Step & Roll, a Wii console, and a Wii Balance Board. I'm sure whoever wins will pay more attention to bananas then. "We're thrilled to partner with Chiquita," says Sean Ratcliffe, Vice President of Marketing for SEGA of America. "This is a fun way to get the whole family together and we are proud to have AiAi and MeeMee featured on clusters of Chiquita Bananas." I'd probably be proud too. Sega has previously teamed up with Dole to cross promote Monkey Ball titles with that company's bananas, but they are the RC Cola to Chiquita's Coca-Cola. Nice to see Sega moving into the big leagues, fruit-wise.